“If you would seek a pleasant peninsula, look around you,” Michigan’s motto suggests. 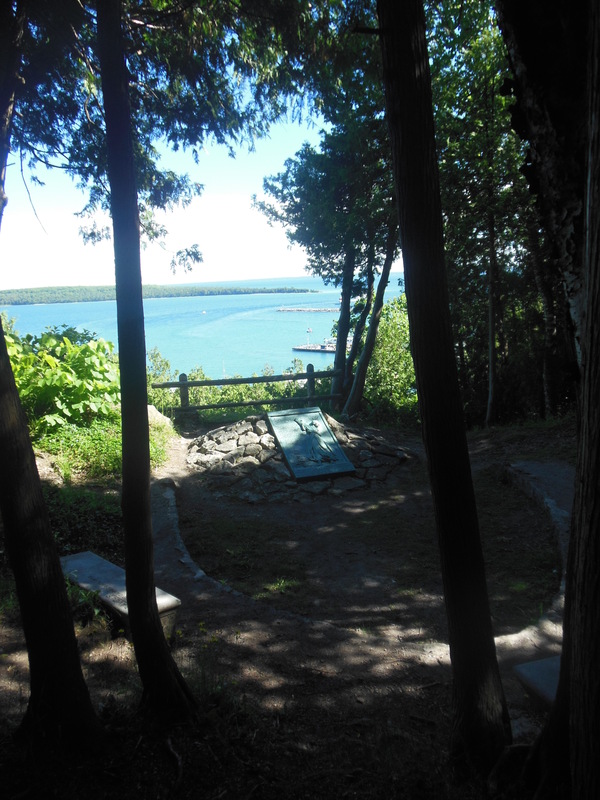 If you seek a spectacular Mackinac Island view, climb the steep stairs to Anne’s Tablet. 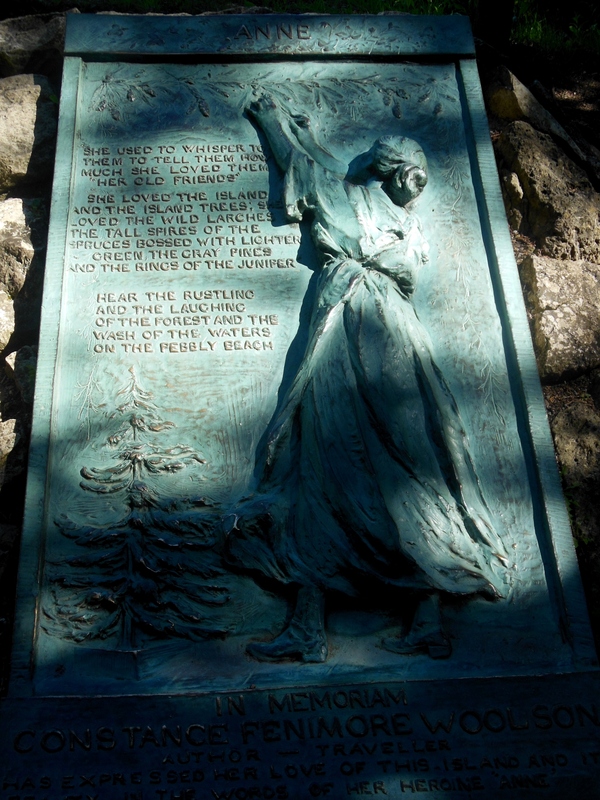 To protect four particularly beautiful panoramas from future development, early-20th-century island cottagers placed commemorative plaques at those locations. Cleveland philanthropist Samuel Mather was one of them; in 1916, he donated money for a tablet in memory of his aunt, Constance Fenimore Woolson. Seeing it was my number-one reason for returning to Mackinac Island last month. My journey began at Marquette Park. We walked behind the Indian Dormitory-turned-art museum and looked upward, since that’s the area where the plaque was supposed to be. We passed the “Be Still” sculpture in the garden commemorating 200 years of peace between the United States and Canada following the War of 1812. 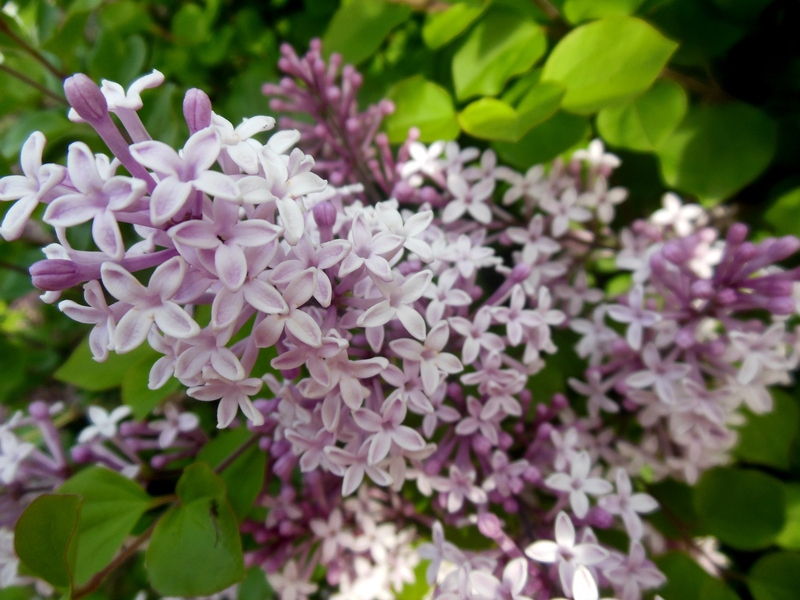 We stopped to admire lilacs in full, fragrant bloom, still in peak form, just days after the conclusion of the annual Mackinac Island Lilac Festival. Continuing through the children’s playground, we spotted a set of wooden stairs. 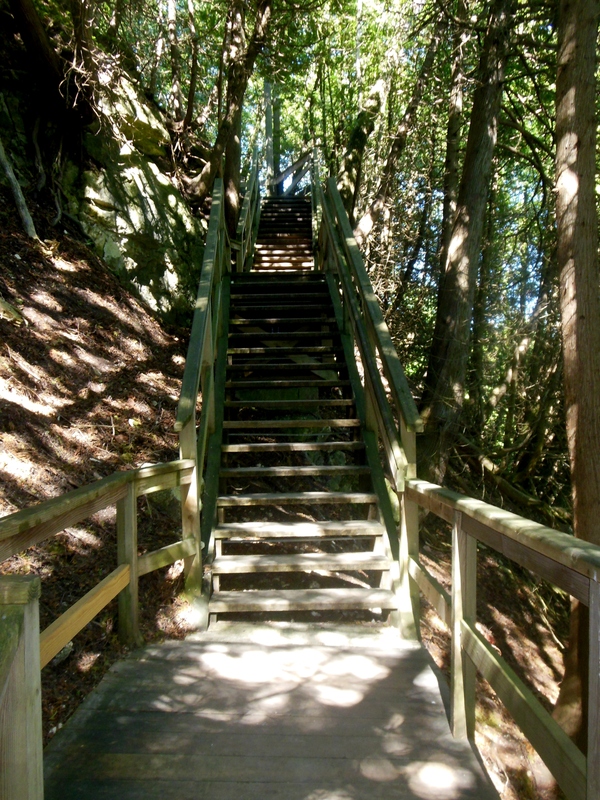 Shaded by firs and basswoods, we climbed…and climbed…and climbed up more stairs, …ascending the steep limestone bluff that was covered in myrtle and still-blooming spring ephemerals. 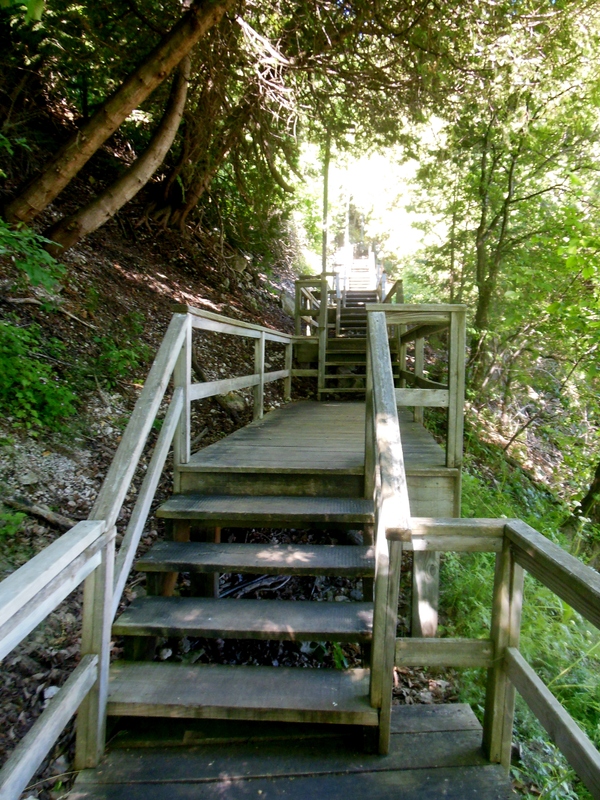 Reaching the top of the trail, we saw the East Bluff Victorian cottages on Huron Road straight ahead. To our left, an inconspicuous sign reading “Anne’s Tablet” pointed westward. Almost there! Countless blooms of northern yellow lungwort lined this trail. But where was the tablet? Others passed by. “Have you seen Anne’s Tablet?,” I asked? “What’s that?,” they answered. Typical. 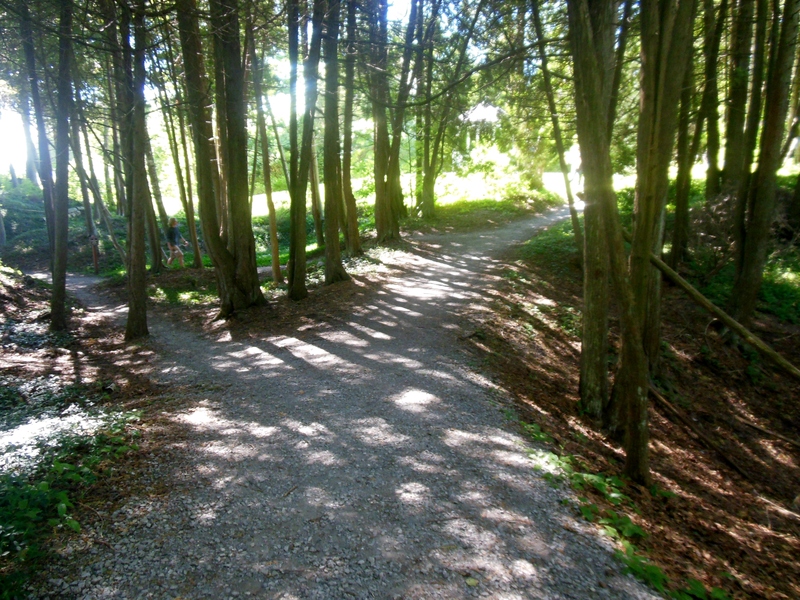 The shaded trail suddenly became sunny. What’s this? The “Somewhere in Time” gazebo? During the summer of 1979, “Somewhere in Time,” the movie starring Jane Seymour and Christopher Reeve, was shot on the island. 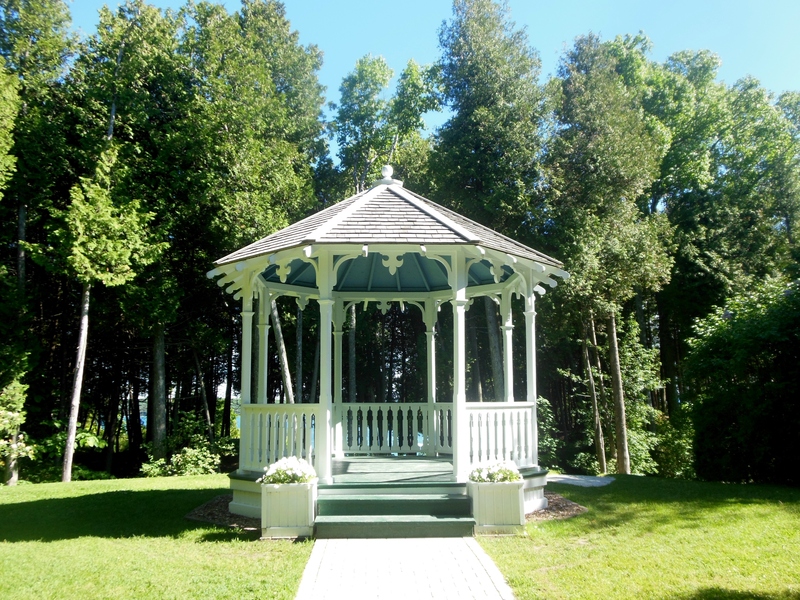 This gazebo was constructed for a scene that was filmed near the island’s public school. Then it was entered as a float in the annual Lilac Festival’s Lilac Parade, with members of the film’s cast and crew standing inside it. 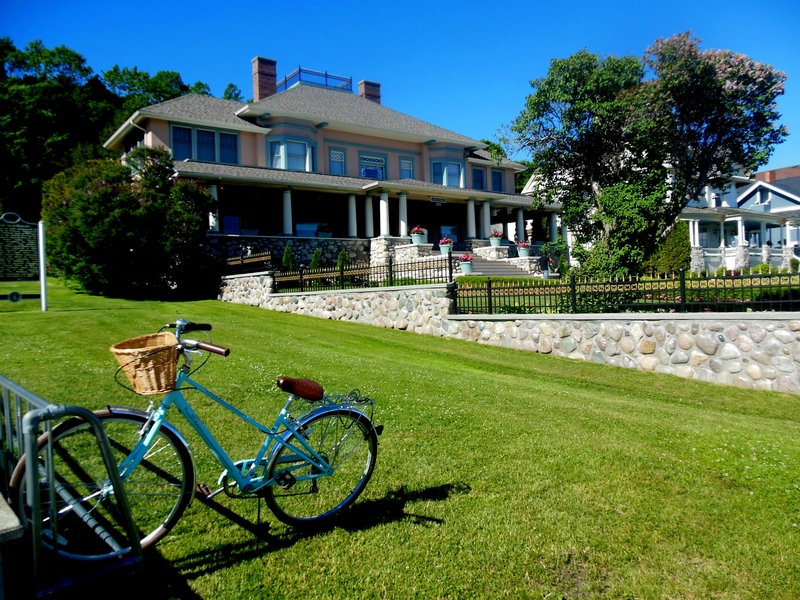 Later, it was placed on the lawn of the Michigan governor’s summer residence on the island. In 2006, it was relocated here. They come from Anne, Woolson’s popular first novel which was first serialized in Harper’s magazine for 18 months, and was then published in book form in 1882. The opening chapters of this coming-of-age story are set on Mackinac Island; how Woolson portrays the island and its inhabitants has led it to be called a regional masterpiece. That called for a photo shoot. We recovered — one of us from the excitement; all three of us from the climb — by taking a break on three small concrete benches surrounding the tablet, all etched with the names of Woolson’s works. 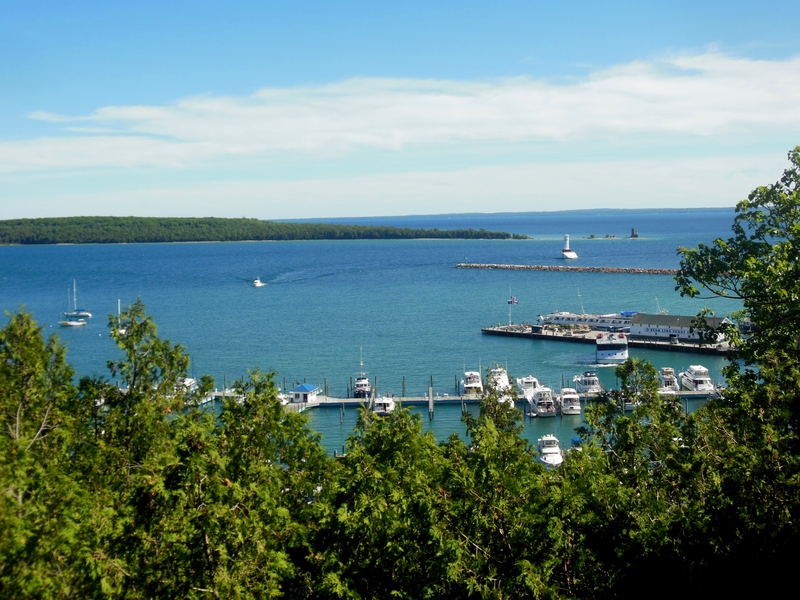 We were rewarded with a magnificent view over the harbor, Haldimand Bay, Round Island and the Straits of Mackinac. Retracing our steps, we descended, finally reaching the place where the Agency House — Anne’s home — which once stood next to the Indian Dormitory. The Agency House burned to the ground in 1873, and the land was replotted into three new lots for cottages. In 1899, an Indiana couple built one of the cottages, naming it “Anne Cottage” in honor of Woolson, whose book was still popular. Later, the cottage was owned by Clara Clemens, daughter of Samuel Clemens (Mark Twain), and New York Yankees owner George Steinbrenner. Today, the cottage looks much as it did when it was expanded in 1915. 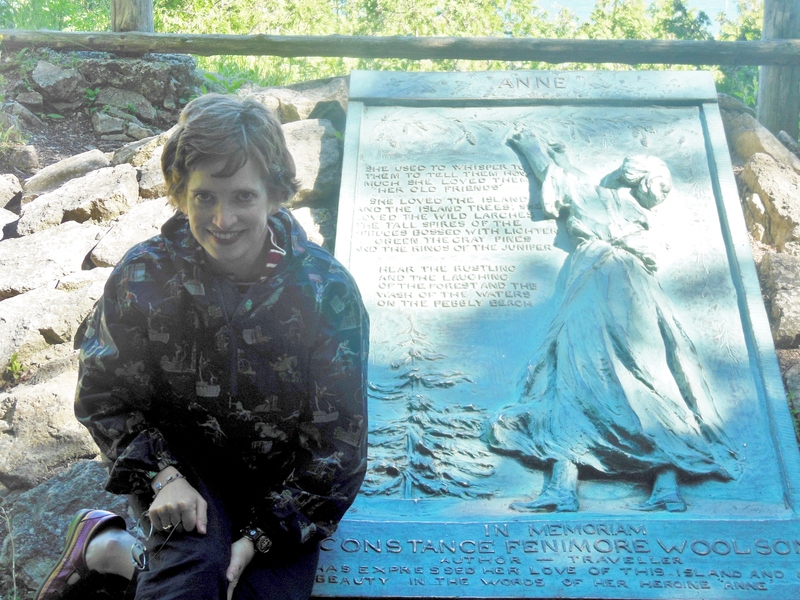 So who was Constance Fenimore Woolson, why was she virtually forgotten beyond the tablet, and why is she being rediscovered today? Constance was born in New Hampshire to a journalist-turned-stove manufacturer and the niece of James Fenimore Cooper, author of The Last of the Mohicans. She grew up in Cleveland, Ohio. When she was 15, her family started summering on Mackinac Island, where she developed a love of nature, edited a manuscript newspaper with a friend, and wrote her first poem, inspired by local Indian legends. 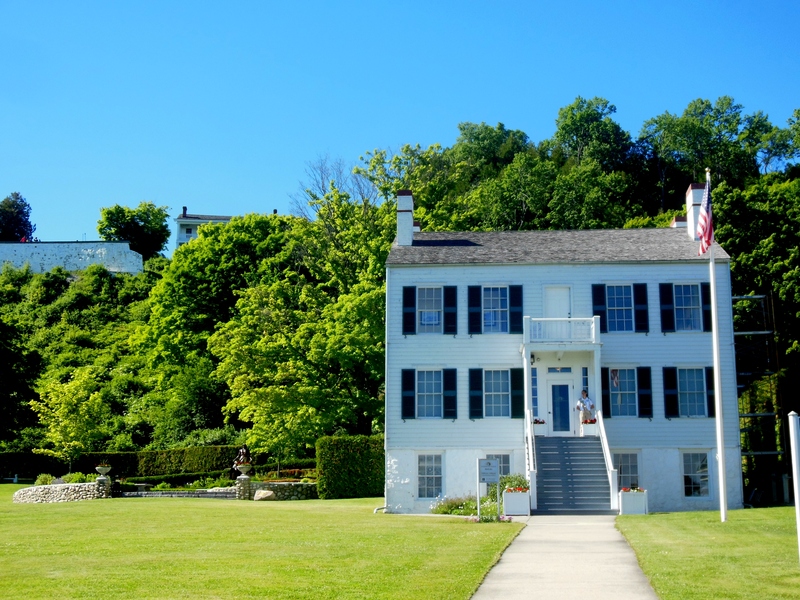 In her later teenage years, Constance and her father traveled throughout Ohio, especially enjoying Zoar, the former religious community established by the Society of Separatists. Her father encouraged her to take in the scenery and record her observations. She started writing. An avid reader, she was influenced by the work of George Eliot, Charlotte Brontë and Charles Dickens. In her great-uncle’s historical romances of frontier and American Indian life, she found a model for how to observe and realistically record the truth. Her first two publications were travel sketches, appearing in Harper’s New Monthly Magazine and Putnam’s magazine in July 1870. A children’s novel, The Old Stone House, came next, followed by a series of Great Lakes-inspired stories in Harper’s and other magazines, including the Atlantic Monthly. 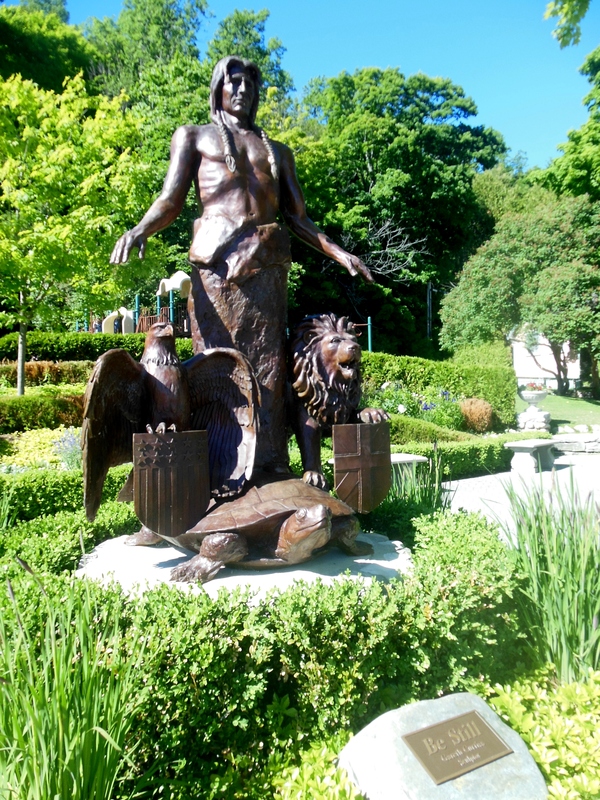 “Jeanette” and “The Lady of Little Fishing” have ties to Mackinac Island; “Solomon” takes place at Zoar. She also spent time in New York City, during which she wrote cultural reviews and letters about her experiences for publication in the Herald, a Cleveland newspaper. Following her father’s death, she, her mother and her sister moved to the South; the time they spent in Florida, the Carolinas and Virginia inspired the fiction she wrote during the mid-to-late-1870s. After their mother died in 1879, the sisters set out on a grand tour, traveling to Egypt, the Holy Land and Europe, which she chose as the setting of her work of the 1880s and early 1890s. The hard-working writer developed a popular following, earning critical success and a place among the top American fiction writers of the late 19th century. She enjoyed friendships with novelist William Dean Howells; statesman John Hay; composer Francis Boott; his daughter, Elizabeth; and her husband, Cincinnati artist Frank Duveneck. While in Florence in the spring of 1880, she met Henry James, who was there writing The Portrait of a Lady. Her story, “A Florentine Experiment,” is based on their initial meeting. The pair became close friends over the next seven years. James’s essay, “Miss Woolson,” appeared in the February 12, 1887 issue of Harper’s Weekly. He based characters in The Wings of the Dove and “The Beast and the Jungle” on her, and paid tribute to her and her stories about the Reconstruction-era South in Partial Portraits. However, Constance’s congenital deafness became so severe that it caused her feelings of isolation and depression. Declining health and financial worries appear to have caused her impulsive decision to fall from the window of a Venetian villa to her death on January 24, 1894. 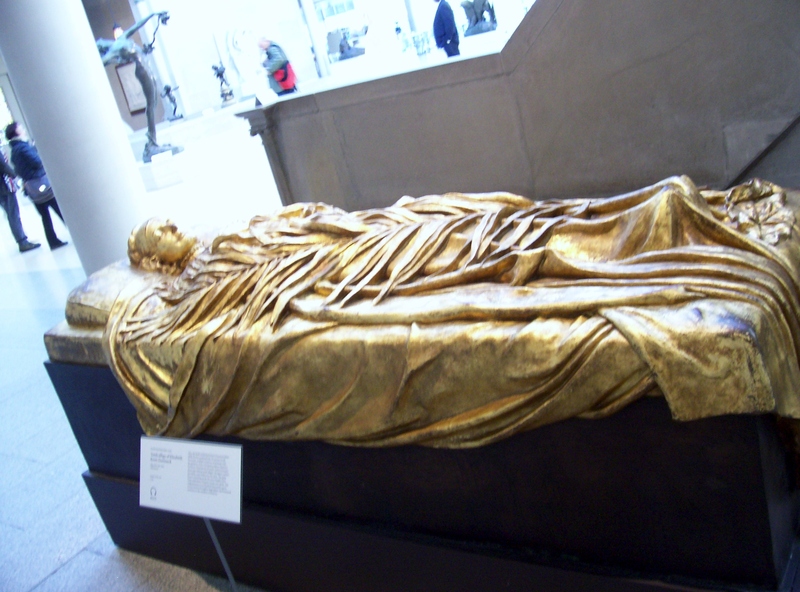 She was buried in the Protestant Cemetery in Rome, her grave marked by a Celtic cross and a bed of violets. Percy Bysshe Shelley and John Keats are buried nearby. That April, James went to Venice and is famously known for submerging her dresses in the lagoon. During her career, Constance Fenimore Woolson published 58 stories, five novels, and several poems and works of travel writing. Considered a pioneer of local-color literature and an accomplished regional writer during her lifetime, she was forgotten during the early 20th century. Authors Anne Boyd Rioux and Colm Tóibín are helping her make a well-deserved comeback. For more on Constance Fenimore Woolson, read Constance Fenimore Woolson: Portrait of a Lady Novelist, by Anne Boyd Rioux; Miss Grief and Other Stories, by Constance Fenimore Woolson, edited by Anne Boyd Rioux; and A Private Life of Henry James: Two Women and His Art, by Lyndall Gordon. Fictional representations of Woolson and her relationship with Henry James can be found in The Master, by Colm Tóibín, and The Open Door, by Elizabeth Maguire. 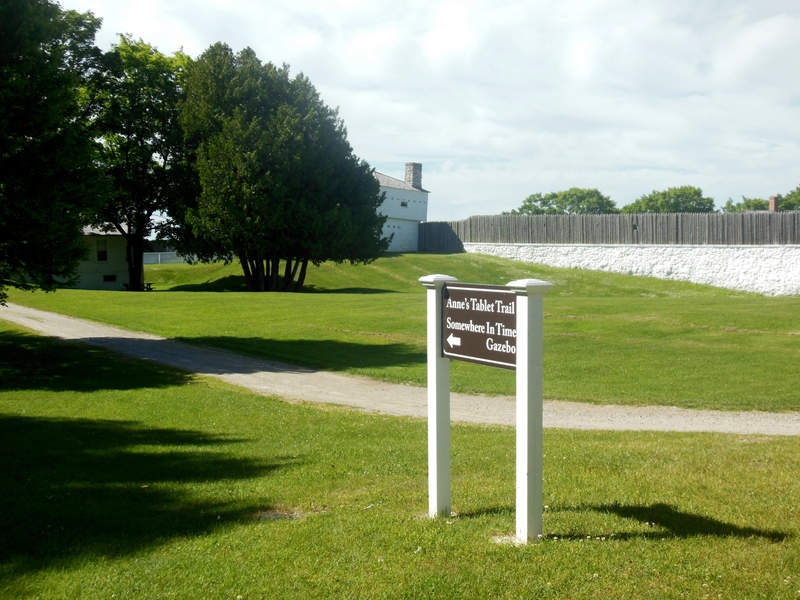 This entry was posted in Books, History, Mackinac Island, Michigan, Nature/Outdoors, Travel. Bookmark the permalink.